The Crucifixion is a life sized painting by the Venetian artist Titian, completed in 1558 and presently hanging in the sanctuary of the church of San Domenico, Ancona. Jesus Christ is shown crucified, with Saint Mary and Saint John standing either side of the cross in the Stabat Mater tradition. The kneeling figure is of Saint Dominic. The canvas was completed during Titian's fifth decade of painting, and is one of the works marking a shift toward his extensive exploration of tragedy and human suffering. 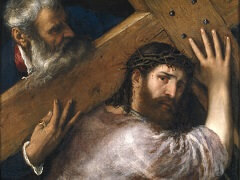 The heads of the standing figures are presented in an upturned triangle arrangement near the base of the cross. 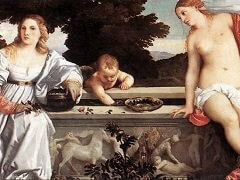 All the figures appear in the foreground, which is on a single plane, lending a sense of immediacy to the picture. The composition is dominated by a colouristic conception of painting in which the picture's predominant dark blue, brown and red hues are pierced through with near-white flashes of light. 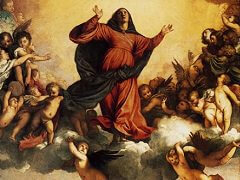 The cloying regions of dark hues, such as the area of browns and near-black comprising the Golgothan terrain from which the saints emerge, intensify the sadness and horror of the crucifixion. Against this, the moonlit highlights draw attention to significant dramatic and emotional elements of the spectacle. 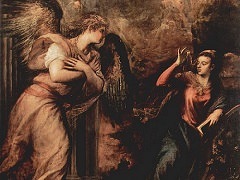 In the late years of his life, in such works as the Ecce Homo (National Gallery of Ireland, Dublin), and the Saint Margaret and the Dragon (Museo del Prado, Madrid), Titian used this method of contrasting of light and colour as a key - or even pivotal - tool for rousing in the viewer a dominant emotion of one kind or another. With the Crucifixion, this method of generating a tragic sensibility is used almost to the exclusion of any other method. 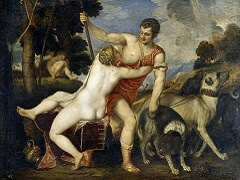 It is one of the earlier - possibly the earliest - and most direct uses of the technique in all of Titian's paintings. 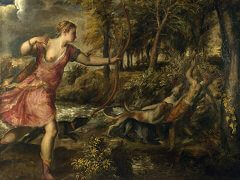 But this was not a practice the artist used in all his paintings from this period, and it is indeed in sharp contrast with The Martyrdom of Saint Lawrence, another depiction of human suffering Titian was completing at the same time he was working on the Crucifixion. Whereas the Crucifixion has a simple layout, The Martyrdom of Saint Lawrence is a complex - almost baroque - composition. Although the use of colour, light and contrast in the Martyrdom has some obvious similarities with the Crucifixion, it makes no use of any plan of monolithically coloured forms to convey any of its message or gravity. 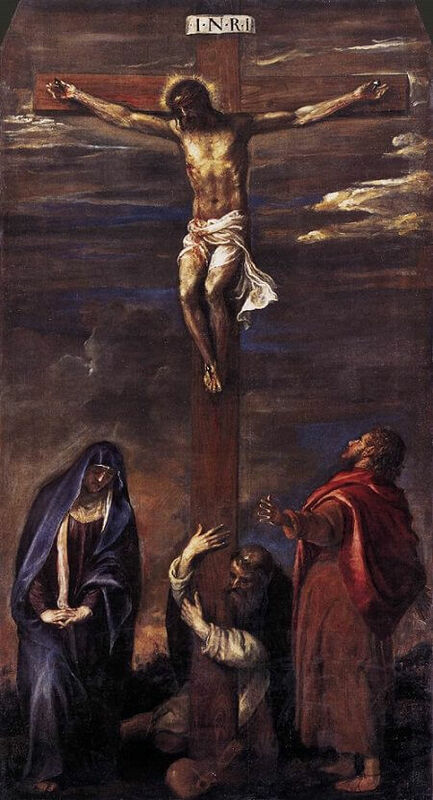 Another notable aspect of Crucifixion as well as other late works from Titian, is the presence of flecks of colour applied across the painting. When the canvas is viewed from a distance, these spots of bold colours have the effect of bringing animation to the surface of the picture.